From Ken Burns, creator of the acclaimed series "The Civil War," comes this monumental look at America's pastime. Chronicling the history of the sport from its genesis in the early 1800s to the modern era, the nine-part series surveys baseball and its relationship to American culture and society. 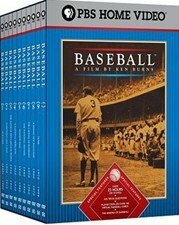 Filled with archival footage, interviews with diamond stars past and present, and commentary from George Will, Bob Costas, Billy Crystal and other notables, this epic is a must-have for all lovers of the game. 18 1/2 hrs. total on 10 discs. Standard; Soundtrack: English Dolby stereo; Subtitles: English, French; "making of" documentary; interviews; trivia quiz; chapter access; baseball timeline; statistics.